Hooray, the Dominion Post is finally taking an interest in architecture! Well Done to their photographer Kent Blechynden with his page 3 photo, a full frontal spread of the boys from PyraDeck striking the scaffolding on part of the Sodo apartments. It’s a lovely photo – well composed, full of little colour accents ie the fluoro Hi-Vi vests of the workers, and its really good to see some new buildings in the paper. The only thing it missed out was the noise aspect as well – each of the men had to say Yep in a loud voice when he had grabbed hold of the next scaffolding pole, so the whole building – the whole of that part of Taranaki St was echoing to the sound of 16 Yeps, like a be-bop version of himalayan chanting, or possibly a avant-garde rapper with not much to say (like the Hiphopopatamous, my lyrics are bottomless…). A rare moment when construction captures the eye – the Fish was there too, and other people watching the artistry of the scaffolders – but my photos aren’t as good as Kent’s pic. 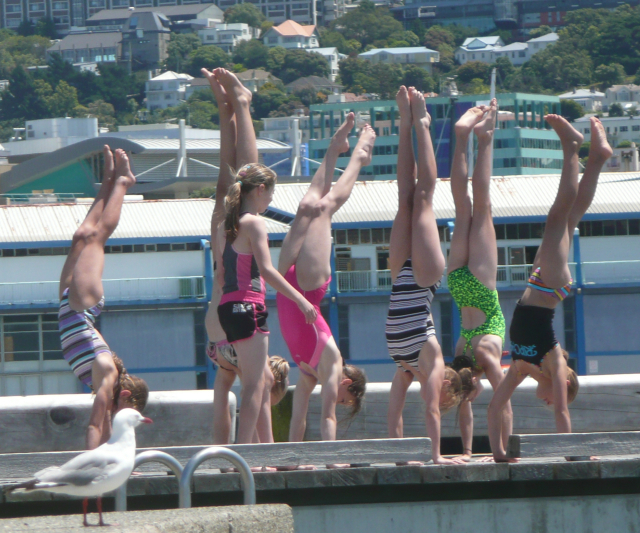 Although I did snap this one just the other day in Welly. We have commented on the building before – its ridiculous name, the tiny rooms, but also the sheer geometric precision the building was being assembled with, like a giant Tetris game I thought. I’ve heard some pretty terrible comments about it from people in the street, or apartment dwellers in the town – there seems to be some disbelief at just how ugly it was looking, and the possible design flaws (such as south-facing open deck entry on the Ghuznee St side – brrr, you can tell it has been designed by an Aucklander with absolutely no concept of just how nasty The Southerly can be), but I’ll try and bite my tongue and keep my thoughts to myself till I’ve had a look around inside. So, in the mean time, feel free to comment on the Sodo, or if you want to tell me if this number is for real – spotted in the window of a prominent Wellington developer…. It was a great photo in the DomPost today. Too bad about the development. As for the tower – it looks like Lambton Quay. But where? Looks to be directly in line with Intercontinental, which would put it on the Whitcoulls site? City Life site? The project in Lambton Quay “was” for a 265m high building , 63 floors, including mast from Lambton Quay level, multi-use including retail, car-parking, hotel, commercial and apartments. The site is exceptional for a Landmark building. The foundations are on solid rock. The project was fully realised in 3D , renderings, animation and drawings. The building was designed by One Architecture, Wellington. I’ve seen renderings and drawings of that building and I have to be honest I’m glad Terry couldn�t get the money in place to build it. Horrible stuff. Century City Developments are definitely not the people Wellington would want building something like this. A lot of people comment on how hideous Terry’s buildings are but that’s nothing compared to how they’re put together. The materials and detailing are truly horrid even for a developer. I’m guessing he had to sell the site to free up some money for the Cuba/Dixon site. He also recently had to make some staff redundant so it’s ironic that he’s the kiwi face for The Apprentice. I personally would’t live in a 46sqm two bedroom apartment therefore no one else should be allowed to. I also personally wouldn’t ride a bike or eat seaweed, therefore no one else should be allowed to ride bikes or eat sushi. Developers, home owners and builders, basically anyone who does instigate and get something built are subject to the rules: the District Plan, the Building Code, consultants, and the council (Building Consent Authority) . There are a whole lot more people involved in the compliance process compared to the 80’s and 90’s, everyone takes on risk now. I think the comments from Sonic View are dated and short-sighted and do not reflect what is happening in Terry’s projects or those of other developers, owners and funders. Are there buildings that look crap? Yes – were they designed and built by all the “right” professionals and builders? Yes It’s not necessarily a developer or the home owner that’s at fault, like it or not everyone has a right to buy (get designed) what they want. That’s no different to choosing who your partner is or what you drive or what you wear, not everyone likes what we see in other people, – that’s life, and so it is the same for architecture. The tall building project is a landmark building and design, the TAG had quite a different view to that expressed by Sonic View. The design is based on the harakeke (flax) with substantial references to the landscape, the settlement of New Zealand and the Maori. Thanks for the comments Caspian X, you sound like you know the project well. It’s an interesting tower project – amazingly tall, in relation to the other buildings modelled around it on the site – and I am amazed that there is room for a building that size on a site that small. From what I can figure out, the James Cook Hotel would be well pissed off as they would lose all their view with this outside their window? But what I am intrigued about is whether there is actually enough room in the building for office space etc, once you have taken up a large chunk with the core. Perhaps that is part of the skill of the design, that it looks so slim while actually being large enough to get in at least 2 stairs and probably 6 lifts, along with say 8 WC per floor. Wellington has so few well designed tall buildings – nearly all are unarticulate junk – the Majestic looks terrible – fat and bloated, uncoordinated, with its silly crown of thorns, and the lower towers really are just a rabble. If Terry and One Arch manage to pull this off, and construct a building this tall, while other more established architects are sitting around chewing the fat, then good on them. But it will require massive amounts of care over the details, close monitoring by the city etc, as to be honest, Terry’s buildings haven’t been the best in terms of quality so far (he’s young, he’s learning), and perhaps may need to rein in the bling factor (perhaps that’s why he has cut his ties with Roger). This building, if it is ever constructed, would become THE icon for Wellington. Sydney is known by the Opera House – Wellington would be known by this skyline. Gotta make sure its right then! Honeywood – you’re right, the model is placed right over the middle of the Terrace. Probably an oversight by the modelmakers. I’ve also noticed a large gap on the Lambton Qy mockup where the former Hallensteins Bldg usually is. The city model from my sources got dropped and buildings were hurriedly put back prior to filming starting, so there are a few errors in placement. The site is about 1200 sq. m for the tall building with an observation deck(s) and cafe at the 61st floor. Not a bad view at all for the public. There is a clear gap in the model on Lambton Quay where the building should be but it looks interesting barring passage down the terrace – gives new meaning to a through-site link. 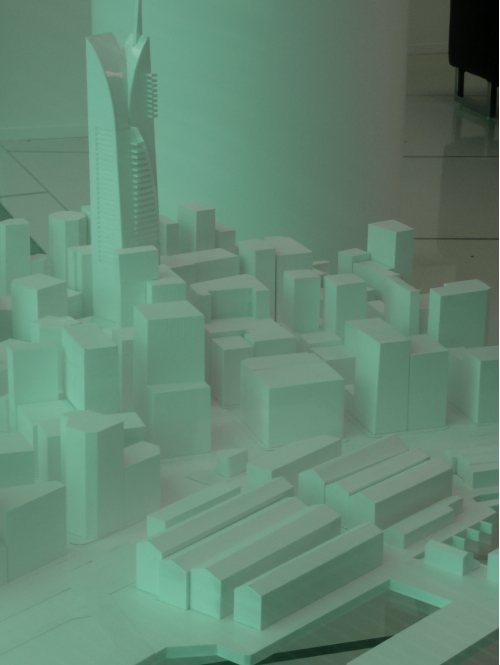 Although if the developer doesn’t know the city -or his project – well enough to notice when the model is amiss, what does this say about him? Nothing we don’t already know I guess.